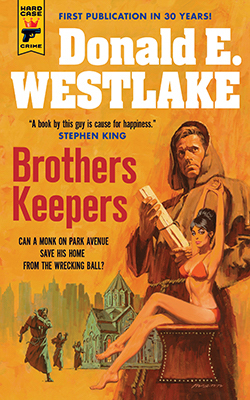 The following is an exclusive excerpt from Brothers Keepers, a revival of Donald E. Westlake’s classic, and the latest installment in the Hard Case Crime series. A historic monastery with a coveted Park avenue address is under attack by developers. How far will the monks go to protect their sacred space? I have not always, of course, been Brother Benedict of the Crispinite Order of the Novum Mundum. In point of fact, for most of my life I wasn’t even a Roman Catholic. I was born, thirty-four years ago, to a family named Rowbottom, and was christened Charles, after a maternal grandfather. My parents having divorced in my youth, my mother next married a gentleman called Finchworthy, whose name I then used for a while. Mr. Finchworthy died in an automobile crash while I was still in high school, and my mother for some reason I never entirely understood reverted to her maiden name, Swellingsburg, taking me with her. She and I had a falling out while I was in college, so I switched back to Rowbottom, under which name I was drafted into the Army. It was simplest to keep that name even after my mother and I settled our differences, so Charles Rowbottom I remained from then until I entered the monastery. So much for my name. (They never leave enough room on application blanks.) As to my becoming Brother Benedict, that all began in my twenty-fourth year, when I met a young lady named Anne Wilmer, a devout Roman Catholic. We fell in love, I proposed marriage and was accepted, and at her urging I undertook instruction to enter her faith. I found Roman Catholicism endlessly fascinating, as arcane and tricky and at times unfathomable as the crossword puzzle in the Sunday Times; and when my mother passed on shortly before I was to be baptized, my new religion was a great source of solace and comfort to me. It was also a great source of solace and comfort a short while later, when Anne Wilmer up and ran off with a Lebanese. A practicing Mohammedan. I suppose it would be fair to say I entered the monastery on the rebound from Anne Wilmer, but that wasn’t the reason I stayed. I had always found the world contradictory and annoying, with no coherent place in it for me. Politically I disagreed equally with Left, Right and Center. I had no strong career goals, and my slight build and college education had left me little to look forward to but a lifetime spent somehow in the service of pieces of paper as a clerk or examiner, an administrator or counselor or staff member. Money was unimportant to me, so long as I was adequately fed and clothed and housed, and I saw no way that I was likely to attain fame or honor or any of the other talismans of worldly success. I was merely Charles Rowbottom, adrift in a white-collar sea of mundane purposelessness, and if Anne Wilmer had ditched me at any other time in my life I would surely have reacted like any of my ten million lookalikes; I would have been unhappy for a month or two, and then found an Anne Wilmer lookalike, and gone ahead with the marriage as originally planned. But the timing was perfect. I had just completed my instructions in Catholicism, and my mind was full of religious repose. 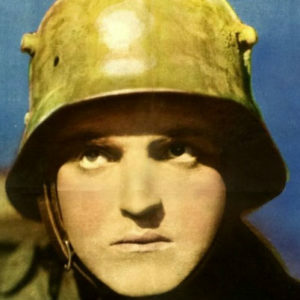 Father Dilray, the priest who had been my instructor, was connected with the Crispinite Order, so I already knew something about it, and when I investigated further it began to seem more and more that the Order of St. Crispin was the perfect solution to the problem of my existence. St. Crispin and his brother St. Crispinian are the patron saints of shoemakers. In the third century the two brothers, members of a noble Roman family, traveled to Soissons where they supported themselves as shoemakers while converting many heathens to Mother Church. The emperor Maximianus (also known as Herculius) had their heads cut off around the year 286, and they were buried at Soissons. Six centuries later they were dug up again—or at any rate somebody was dug up—and transferred partly to Osnabrück and partly to Rome. Whether all the parts of each brother are in the same place or not is anybody’s guess. The Crispinite Order of the Novum Mundum was begun in New York City in 1777 by Israel Zapatero, a half-Moorish Spanish Jew who had converted to Catholicism solely to get himself and his worldly goods safely out of Spain so he could emigrate to America, but who then underwent a miracle in mid-ocean, a vision in which Saints Crispin and Crispinian appeared to him and told him the Church had saved his life and goods so that both could be turned to the greater glory of God. Thus, upon arrival in New York, Zapatero took a ninety-nine year lease on a bit of land north of the main part of Manhattan, assembled some monks from somewhere, and built a monastery. The Order sputtered along, supported by Zapatero and by begging, but never had more than half a dozen monks in residence until the Civil War, when a sudden upsurge in vocations occurred. Just after the turn of the century there was a schism, and a dissident faction went off to found the Crispinianite Order in South Brooklyn, but that by-blow faded away long since, while the original Order has continued to prosper, within its limitations. The limitations are many. We are still within the confines of the one original monastery, with no intention or hope of ever expanding. We are neither a teaching nor a missionary Order, and so are little heard of in the outside world. We are a contemplative Order, concerning ourselves with thoughts of God and Travel. There are at the moment sixteen of us, housed in the original Spanish-Moorish-Colonial-Greek-Hebraic building put up by Israel Zapatero nearly two centuries ago, which has room for only twenty residents at the most. Our meditations on Travel have so far produced the one firm conclusion that Travel should never be undertaken lightly, and only when absolutely necessary to the furthering of the glory of God among men—which means we rarely go anywhere. All of which suits me admirably. I prefer not to be part of a large sprawling hierarchical organization, some monkish Pentagon somewhere, but feel more comfortable with the casual comradeship possible among sixteen mild-mannered men sharing the same roof. I also like the monastery building itself, its tumbled together conglomeration of styles, the dark warmth of the chestnut woodwork everywhere within, the intricate carving in the chapel and refectory and offices, the tile mosaic floors, the arched ceilings, the gray stone block exterior: the whole giving the effect of a California Spanish mission and a medieval English monastery intermingled in the mind of Cecil B. DeMille. As to Travel, I never did care much for that. I am perfectly willing to spend the rest of my life within the monastery walls as Brother Benedict, now and forever. Except, of course, for my weekly sally to Lexington Avenue for the Sunday Times. I strode briskly down Lex toward the newsstand, brown robe whishing around my legs, cross dangling at my side from the white cord that encircled my waist, sandals slapping the pavement with a double te-thwack. It was a beautiful crisp late autumn evening, the first weekend in December, perfect for a walk. The air was clean and chill, the sky was clear, and a few of the brightest stars could actually be seen through New York’s aureole. The sidewalks were crowded with Saturday night revelers; couples strolling hand in hand, cheerful groups in loud happy conversation. I returned the occasional surprised look with a smile and a nod, and strode on. Some evenings I was treated to passing witticisms from people misunderstanding my garb and thinking me merely an isolated nut, but those were mostly out-of-towners who did that; New Yorkers are used to weirdos on their streets. Some evenings I was treated to passing witticisms from people misunderstanding my garb and thinking me merely an isolated nut, but those were mostly out-of-towners who did that; New Yorkers are used to weirdos on their streets. “Evening,” I said. Years ago I gave up trying to explain to him that I was not a Father but a Brother, not a priest but a monk. I cannot say Mass or hear confessions or give extreme unction or perform marriages or do any of the other priestly duties. I am the male equivalent of a nun: a Brother, as she is a Sister. But it was too fine a distinction for the news vendor, who from his accent I took to be Jewish, out of Russia via Brooklyn. After a year or so of gentle corrections, week in and week out, I had finally given up and now acknowledged the greeting for what it was—a friendly salutation between merchant and customer—and let it go at that. The Sunday Times is never a particularly small newspaper, but in the two months before Christmas it becomes positively engorged, reaching at times to a thousand pages. It has been my practice for years to stop at the trash basket just north of the newsstand and lighten my load by depositing therein those sections of the paper we have no use for in the monastery. (There was some discussion several years ago, led mostly by Brother Flavian, a true firebrand, that this habit of mine was actually a form of censorship, but that storm long since abated, mostly because it simply wasn’t true.) The Classified sections go, of course, and all advertising supplements, and Real Estate. Travel And Resorts goes, since the Times’s philosophy in re Travel is so utterly at variance with our own. (Brother Flavian’s chief weapon of attack that was, till he admitted he himself wouldn’t read Travel And Resorts if I did bring it home.) At the request of various Brothers, however, I do keep News, Sports, Book Review, Magazine, Week In Review and Arts And Leisure. Which, prior to Christmas, is armload enough for anyone. And so I headed home, slightly lightened. As I walked tonight I reflected on how totally this neighborhood had changed since Israel Zapatero and his tiny band had first put up our building on a leased bit of barren land surrounded by farms and woods and small—but growing—communities. Zapatero would hardly recognize the place now, nestled amid the hotels and office buildings of midtown Manhattan. We are on Park Avenue between 51st and 52nd Streets, and the city has rather grown up around us. The Waldorf-Astoria is two blocks to the south, the Manufacturers Hanover Trust Building is across the way, the House of Seagram is one block to the north, the Racquet and Tennis Club is diagonally opposite, and our other near neighbors include the International Telephone & Telegraph Building, the Colgate-Palmolive Building, and Lever House. We have been called an anachronism, our little monastery squatting amid all those high-priced high rises, and I suppose we are. But we don’t mind; we rather enjoy the bustle and scurry of the world around us. It gives more meaning to our own silences and meditations. I must say, however, that I am yet to become reconciled to the PanAm Building, jutting up out of Grand Central Station like the hilt of a bayonet out of some beautiful creature that has been stabbed in the back. Much construction has been undertaken on Park Avenue in the past decade or so, and while beauty rarely has seemed to have been a part of the overall intention, most of the buildings are at least clean and neat and inoffensive, like a bleached bone in the desert. Only PanAm rouses me to an un-Christlike irritation; but then, they have the wrong idea about Travel, too. I returned home tonight without looking directly at PanAm— it is less garish yet more sinister after dark—and carried the paper to the calefactory, where the usual cluster of Brothers awaited its arrival. Brother Mallory, a former boxer and onetime ranking welterweight, had first call on Sports. Brother Flavian, the firebrand, was as ever pacing by the doorway awaiting the editorial page in the Week In Review. Brother Oliver, our Abbot, has priority on the News section, and Brother Peregrine, whose checkered career in the theater included both set design Off Broadway and summer theater ownership somewhere in the Midwest, kept up with his former vocation through Arts And Leisure. The Book Review was for Brother Silas, who had once had published a nonfiction book describing his career as pickpocket-burglar (all prior to his joining our Order, of course), and I myself kept the Magazine, with its crossword puzzle; my one vice. Which meant that I didn’t read Ada Louise Huxtable’s column on architecture in Arts And Leisure until the following afternoon. The instant I did, of course, I went direct to the Abbot. He lowered his brush and looked at me reluctantly. “Is it important?” he asked. He sighed, and put down palette and brush. “Very well,” he said. Stocky and white-haired and as gentle as any dishwashing product on the market, Brother Oliver was now sixty-two and had been Abbot since he was fifty-six. He’d taken up painting only four years ago, and had already filled most of our corridors with his Madonnae and Children, done in a number of recognizable styles and with a great deal of meticulous craftsmanship, but not very much talent. Even after putting down his palette and brush, Brother Oliver gazed wistfully at his painting a few seconds longer, studying it as though he would have liked to enter it, climb in and go for a stroll amid the broken stone columns in the murky background. “This,” I said, and handed him the paper, folded to the right part of the right page. He sighed again. Then, slowly and with much reluctance, he began to read. I watched Brother Oliver as he read, and I saw his face change when he suddenly understood what was being said. “Yes,” I said. “Yes, indeed.” The fact that Israel Zapatero had put up this building on leased land was mentioned in the small biography of our Founder given to each new entrant to the Order, but it had never occurred to me that we were still in a leasing arrangement. When I’d read that item about the sale, I’d assumed it was either an error or possibly some plan of Brother Oliver’s that he hadn’t yet decided to mention to the community at large. Now it was apparently something much worse; we didn’t own the land we stood on, and our lovely old monstrosity of a monastery—our home—was perhaps to be torn down around our ears. “Of course,” I said, and as I did so my eye was caught by a streak of orange on Brother Oliver’s easel. That object in the tray, was it not an orange Flair? Brother Oliver turned away again, hurrying toward the door. Bewildered, he frowned in the direction I was pointing. “This pen.” I picked it up. “It belongs to Brother Valerian,” I said. “Thank you,” I said, and we hurried off on our separate missions. I felt a great relief at having found the Flair after all—I would have been hard pressed to come up with the forty-nine cents to replace it—but my joy was tempered by my realization that at the very moment of discovering the Flair I had committed yet another sin; I had lied to the Abbot in saying I’d “borrowed” the pen. Ah, well. Father Banzolini would be back to hear confessions again on Tuesday. From BROTHERS KEEPERS. Used with the permission of the publisher, Hard Case Crime. Copyright © 1975 by Donald E. Westlake.